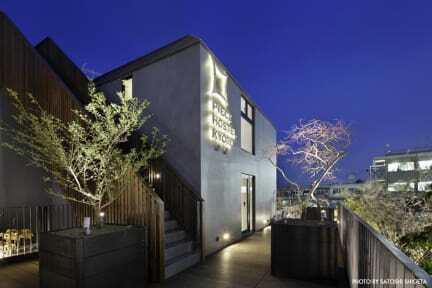 PIECE HOSTEL KYOTO is a new trend boutique hostel, located in Kyoto: the heart of Japanese culture. With only a 2-minute walk, PIECE HOSTEL KYOTO is the nearest hostel from Kyoto Station - the city's main railway station. As opposed to luxury hotels, we provide minimum space for a comfortable sleep. However, PIECE HOSTEL KYOTO is built for Active Travelers to meet people from around the world and experience Kyoto beyond surface, at an affordable price. By 'Active Travelers', we mean those who travel the world with an open heart to new experiences; those in search of people, of adventure, and of discovery. If this is your traveling style, let us be a PIECE of your journey. Our stylish, inspirational, cozy communal space is the HEART of PIECE. * Relaxing Tatami Garden where you can experience Japanese tea ceremonies. 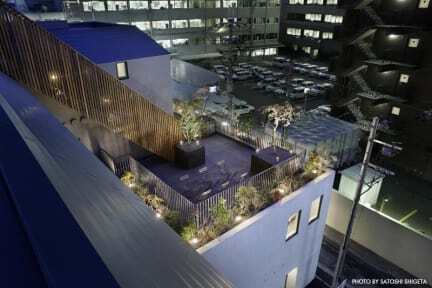 * SORA Terrace surrounded by 30 kinds of Japanese flowers and plants, designed by a famous Plant Hunter, Seijun Nishihata. * Library space where you have FREE access to Mac computers and over 300 books of Kyoto / Japanese culture. * Free Wi-Fi in communal space, private rooms and dormitory rooms. All room types include air-conditioner, free Wi-Fi, personal bedside light, free linen, and free towels. All beds are equipped with comfortable memory foam mattresses (except sofa beds). Bathrooms and showers are shared. To reserve a private room, you must pay for all the beds, regardless of the number of people. Custom-made bunk beds are surrounded by walls and curtains to ensure privacy. Equipped with: semi-double bunk bed (120x210cm), comfortable memory foam mattresses, private curtain, personal bedside light, electrical outlet, luggage space, and security locker. Custom-made extra long bunk beds with luggage space within your personal space. Equipped with: Extra long semi-double bunk bed (120X250cm), comfortable memory foam mattresses, private luggage space, private curtain, personal bedside light, electrical outlet, and security locker. The custom-made extra long bunk beds with luggage space within your personal space. Equipped with: 2 semi-double bunk beds (120X250cm), 1 sofa bed (bed size: 140X200cm), personal bedside light, electrical outlet, 40 inch TV, and comfortable memory foam mattresses in bunk bed. Equipped with: 2 semi-double bunk beds (120X210cm), 2 sofa beds (bed size: 140X200cm), personal bedside light, electrical outlet, 40 inch TV, and comfortable memory foam mattresses in bunk bed. Equipped with: Single-sized bunk bed with stairs (100cm), comfortable memory foam mattresses, personal bedside light, electrical outlet, 32 inch TV and private sink. Equipped with: King-sized bed (180cm), comfortable memory foam mattress, electrical outlet, 32 inch TV, and private sink. Equipped with: Single-sized bed (100cm), comfortable memory foam mattress, electrical outlet, 32 inch TV, and private sink. Please inform us at kyoto@piecehostel.com beforehand if you wish to make a reservation for more than 10 people. We may not be able to accept your booking, which may result in you losing your deposit. - Group bookings can be cancelled free of charge up till 4 weeks prior to arrival date. - Reservations cancelled 4-2 weeks prior to arrival date incur a penalty of 30% of the full stay. - Reservations cancelled 2-1 weeks prior to arrival date incur a penalty of 50% of the full stay. - Reservations cancelled 1 week-3 days prior to arrival date incur a penalty of 80% of the full stay.